Emmie Oddie (Ducie) C.M., S.O.M. died 6 July 2013 in Regina at the age of 97 years. Predeceased by her parents Emma Jane Ducie (Roberts) and Harry Ducie, her husband Langford Oddie, a sister Rose Jardine and a brother, Harold Ducie, Emmie is survived by her daughter Rosemary Oddie (Berks Browne) and her son Will Oddie (Elaine McNeil) all of Regina and grandchildren Lachlan Oddie (Stana Luxford) and Liam Oddie (Jennifer Arndt), Colin McNeil (Melynda Loder), Katharine McNeil (Chris Haas) and Erin McNicol (Curran McNicol), Louis Browne (Susan Browne) and eleven great grandchildren as well as numerous nieces and nephews. Born in 1916, Emmie grew up on a farm near Dundurn, Sask. She completed her high school by correspondence also completing an A.T.C.M. in piano at the same time. 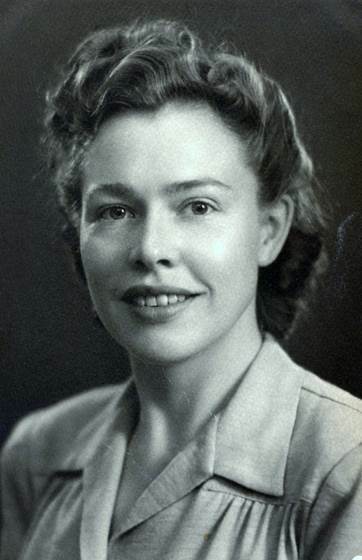 She went on to get a Bachelor of Household Science at the University of Saskatchewan in 1941 and a Master of Science degree from Washington State College in 1943. Following her graduation, Emmie worked for the Toronto Red Cross as a nutritionist for a year and then came back to Saskatchewan working at the University of Saskatchewan Extension Division. In 1946 Emmie married Langford Oddie, an agrologist and farmer, raising two children, Rosemary and Will on a farm at Tregarva, SK (near Regina). In addition to the work required on the farm, Emmie wrote a column for the weekly prairie paper, The Western Producer, titled “I’d Like to Know” which was read and respected by farm families across Canada. Emmie continued writing the column unbroken for 47 years, retiring in 1995 at the age of 79. An enthusiastic member of her local Homemakers’ Club (which later became the Women’s Institute) led Emmie to years of involvement at the district, provincial and national level where she became National President of the Women’s Institutes of Canada from 1979 to 1982 traveling on behalf of the group to Beijing, Nairobi and Australia. She was also a local 4H leader and a judge at 4H achievement days and at provincial exhibitions. Emmie was a valued board member of many organizations including the Saskatchewan Arts Board, the Saskatchewan Milk Control Board and on a task force on food item pricing. She served one term as the president of the Saskatchewan Home Economics Association and later represented that body on the University of Regina Senate. When her children were older, Emmie undertook teaching duties as a special lecturer for the College of Home Economics and the University of Saskatchewan Extension Division. In her retirement years she worked extensively with the HELP (Home Economics for Living Project) in Regina. Emmie was justly rewarded with life memberships to many organizations (the Association of Saskatchewan Home Economics; Canadian Home Economics Association; The Saskatchewan Women’s Institutes and the Federated Women’s Institutes of Canada; The Saskatchewan Home Economics Teacher’s Association). She also received many prestigious awards for her contributions to the profession and to rural women’s organizations, including among others, an Honour Award from the Canadian Home Economics Association, induction into the Saskatchewan Agricultural Hall of Fame, being named a member of the Order of Canada and the Saskatchewan Order of Merit. Emmie and Langford were members of the Unitarian community in Regina for many years and up until she was 91, she continued to play the piano for Sunday meetings. Over the years, piano played an important part in Emmie’s life –playing for community and family functions, giving lessons to grandchildren, and entertaining others at the care home in which she resided. Typically and as long as she was able, Emmie was always giving of herself. As well as her many accomplishments and job responsibilities, Emmie was foremost a devoted wife, a loving and supportive mother and a wonderful grandmother to her many grandchildren and eventually to her great-grandchildren. It was her wish to be cremated. A memorial service will be held on July 17th at 2:00 pm at the Unitarian Centre at 2700 College Avenue in Regina.